History, like truth, is stranger than fiction. Maybe that’s why so many don’t pay any attention to either. Maybe that’s why I enjoy history so much. 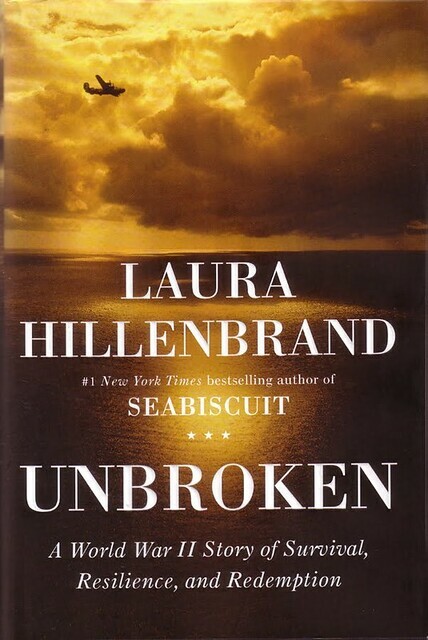 My latest historical read was Unbroken by Laura Hillenbrand. She got us to read a book about a horse and has done another phenomenal job telling us a World War II story of survival, resilience, and redemption. Although she tells the story primarily through Louis Zamperini’s experience, we know that an entire generation worldwide was also part of that story. Louis Zamperini was already an Olympian, having competed in the 1936 Olympics in Berlin, when he was drafted for the Army Air Corps. Even that training could never prepare him, nor anyone else for that matter, for what he would experience surviving the war. In some respects, physically surviving was easier than putting his life together when the war ended and he returned home. I think one reason this story so powerful today is where we are [again!] as a nation with troops coming home after a long siege of wars in countries whose cultures we don’t fully understand. Their lives have been irrevocable altered and most of us won’t have any point of reference to help us understand. The truth of war forces us to look at its horrific impact on individuals, their families and friends. The writer of Ecclesiastics declared there was nothing new under the sun. If we look at history, I think he’s absolutely correct. If we learn nothing else, we learn that humanity is very creative in repackaging how it repeats history. I think it’s also the reason history gives me hope. We’ve seen it before, we survive (sometimes barely) and thankfully, some of the lessons are passed down to subsequent generations. History may not be your thing, but Unbroken is very engaging and readable. You won’t be disappointed!